We’re all familiar with the rather silly adolescent game of chicken — A group of people stand in the middle of on-coming traffic and the last one to jump out of the way “wins”. Or in another version, two kids drive cars toward one another and the one that swerves “loses”. As adults, we look down on such ridiculous games, but then go on to play them in different forms at work. One of the more common incarnations is affectionately called “schedule chicken”. Instead of oncoming cars, it’s oncoming deadlines and the first one to admit they are going to be late, loses, allowing all the other team members to silently miss their deadlines without the shame of being the one who had to fess up to it. Somehow this has become an accepted modus operandi within many companies, managers rewarding those who never announce their slips even though the same ones rarely hit their deadlines. As we’ve discussed here before, knowledge work is difficult to plan and predict. Inevitably we miss some predictions because of various uncertainties about what we know. As a result, it’s common to introduce the concept of risk as a way of representing this uncertainty. We believe that we can get something done in two weeks, but there is some amount of risk that it won’t happen. We can then represent changes to the plan as either increasing or decreasing our risk of hitting the schedule. Done well, this can help teams discuss the difficulties in a way that allows for discussions of tradeoffs. Discussion of risk only works well though if we’re not playing chicken. If we don’t want to announce a change in the schedule or say that we can’t meet some particular deadline, when we get asked to make a change, we still discuss its impact on the risk. At the beginning, this is meaningful but eventually we’ve taken on so much risk while still committing to the schedule, that taking on more is really not going to change the outcome – missing the deadline is inevitable. Imagine if we found ourselves jumping out of an airplane without a parachute but with a helmet. The amount of risk that we’ve already taken is ridiculously high. If we’re then asked to take off our helmet and shoes, while we can say it increases risk, the additional risk is negligible compared to the ground barreling down at us. At this point, the conversation of risk loses it’s meaning. 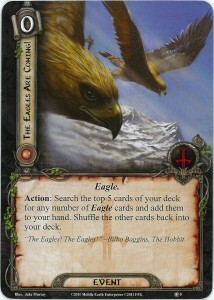 Just like Gandalf and Bilbo, we’re just waiting for the eagles to come. When we reach this point, we’ve essentially decided to make the ultimate chicken gambit. We will not lose, we will not jump out of the way, we will just hope that the car swerves (or that the eagles arrive). Maybe some miracle will occur and our project will be delivered on time or the other guy will admit they need more time. If it does not, at least we didn’t lose or perhaps, at least we didn’t lose alone. But we do lose. Maybe not our lives, but our integrity. Even if by some miracle, no one notices because someone else gives in first, it doesn’t make the decision right. At work, with critical projects on the line, having a meaningful discussion of risk needs to be maintained since it provides the ability to openly communicate both about the intent to deliver as close to on-time as possible while honestly representing why it might not happen. It allows others to plan their actions likewise and work together toward mutual success. Having these realistic discussions should be rewarded instead of punished by management. As adolescents driving cars, or as adults working with our teams or partners, getting into a game of chicken is not a recipe for success, it’s a recipe for getting fried.